As I have mentioned before, I am always being inspired by beautiful friends. I very rarely have an original idea! I have recently been inspired, once again, by my gorgeous friend Jo. I took Evie around to Jo’s lovely new house for a play date with her daughter (and a Mummy-gossip session of course) and when Jo showed me a beautiful dress she’d recently made, I went straight home and made one for Evie. Luckily Jo swiftly emailed me the pattern link and I was able to stitch away immediately. It’s a very basic style and pattern that I was able to whip up in an hour. I think it’s all about the fabric choice to ensure that this dress is eye-catching and much more than just a simple pattern. I hope to layer it up over the Autumn and Winter with tights and long sleeve tops (in this case cream, black, blue or red/maroon). I am also planning on making some more with some of the cute fabrics I have sitting around. 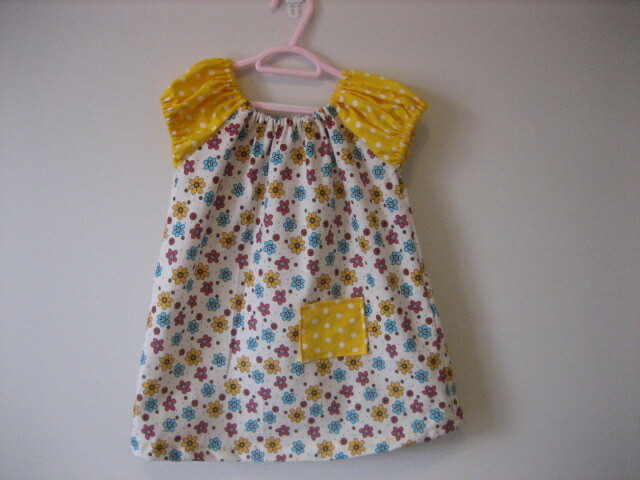 This entry was posted in Sewing Random and tagged clothing, fabric choice by sewandbakeandlove. Bookmark the permalink. Why thank you Shan! Not sure about the patient bit! How interesting to hear about your inspiration. Did you know who she was before going to HK? Thanks. I always have HEAPS of inspiration around!! It’s so cute, well done. This is a dress you should save when Evie grows out of it – because it deserves to be kept as a special baby dress. My mum has saved many dresses that we wore when we were small and it’s so funny to see them now. That’s a great idea – I’m going to do that! Thanks. LOVE the fabric too – I have made an Ipad cover out of it too, so Evie’s dress matches. Thanks Pol – Jo is certainly talented! Maybe you should try your hand at sewing?!? !